After going through the NUOVA experience last year, I know the most important thing will be to get caught up on my sleep! In addition to having an excuse for an extra nap I have been working on the challenge of the Yorkshire dialect! It has been many hours spent with IPA, recordings and repetition. It will all be worth it to bring this hilarious and caring character to life. The faculty are truly what makes NUOVA such an incredible program. This year is no exception! Getting the chance to work with so many amazing teachers from all over Canada is what sets this program apart. The shift in focus to add classes such as clown and movement in collaboration with voice work is going to be an amazing addition to my studies at school! Brenley Palmer is a young soprano who has a passion for both musical theatre and opera. She graduated last year from Brandon University where she attained a bachelors in vocal performance under the study of Naomi Forman. Throughout her degree, she focused on a classical style of singing while also working on her musical theatre technique in lessons and on the stage in the community. In addition, she has completed a theatre minor under the instruction of James Forsythe. Brenley is originally from Winnipeg and grew up studying under Paula Potosky. She has been an active performer in the Brandon Area, most notably as Robin in 7 Ages production of Godspell and Hodel in Fiddler on the Roof. During her time at Brandon University, she participated in the theatre departments production of InterSEXtions as Ellen, and the title role of Captain Lovelock in the School of Music’s Opera. 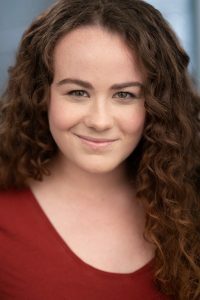 Brenley spent last summer with Opera NUOVA performing in their production of Into the Woods as Little Red Riding Hood and is excited to be making her return in 2019 as Martha in The Secret Garden. Brenley is currently living in Victoria and studying at the Canadian College of Performing Arts.